Older people are particularly vulnerable to social isolation and loneliness owing to loss of friends and family, mobility and income. Loneliness has been described as an unwelcome feeling of lack or loss of companionship, marked by a discrepancy between the contact people have and what they desire (http://www.jrf.org.uk/sites/files/jrf/loneliness-neighbourhoods-engagement-full.pdf). Estimates suggest that around 20% of those aged 65 and over experience mild loneliness with a further 8-10% experiencing intense loneliness, which would equate to around 38,000 older people experiencing mild loneliness in Devon, and a further 15,000 to 19,000 experiencing intense loneliness (http://campaigntoendloneliness.org/toolkit/wp-content/uploads/Statistics.pdf). 42.8% of social care users surveyed in Devon in 2014-15 reported being satisfied with their social situation. This was significantly below South West (45.7%), local authority comparator group (45.4%) and England (44.8%) rates. 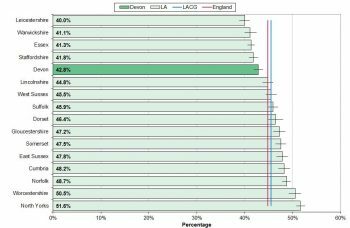 Rates across Devon’s local authority comparator group are shown in figure 10.26. 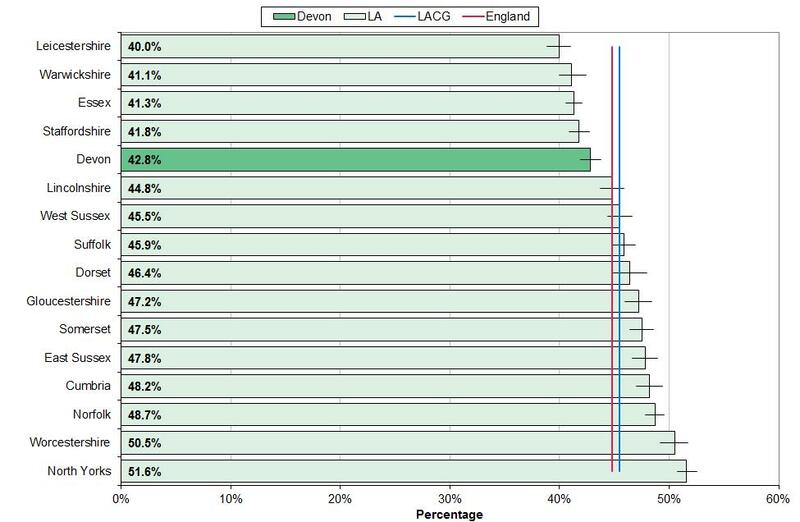 Within Devon whilst there is some variation in responses at district level, smaller sample sizes mean the differences are not statistically significant. Rates decreased significantly on 2013-14 levels (47.5%). Female social care users in Devon reported being more satisfied with their social situation than male social care users. Social care users with Learning Disabilities reported being the most satisfied with their level of social contact compared with other client groups. One of the most common mental health conditions in older people is depression. Depression affects proportionately older people than any other demographic group, because older people face more events and situations that may trigger depression: physical illness, debilitating physical conditions, bereavement, poverty and isolation. The majority of people who have depression make a full recovery after appropriate treatment, and older people are just as responsive to treatment as younger people. Communities and support services can help older people address some of the causes of depression such as social isolation, financial problems, or difficulties with their accommodation. Figure 10.27 shows average self-reported happiness by age, which shows that levels of happiness are lowest in people in their 40s and 50s, increase around retirement age and reduce from the age of 70 onwards, with social isolation and loneliness a major factor. The Campaign to End Loneliness has set out a guide to risk factors associated with loneliness (http://campaigntoendloneliness.org/guidance/wp-content/uploads/2015/06/Risk-factorsGFLA.pdf) and these risk factors are set out in figure 10.28. Risk factors are diverse, covering personal characteristics including age, ethnicity and sexuality; personal circumstances such as living alone or living in residential care; health status including disability, poor health and sensory impairment; and geographic factors such as deprivation and crime in the local area. Transitions can act as particular triggers including retirement, bereavement, and either taking on or giving up caring responsibilities. 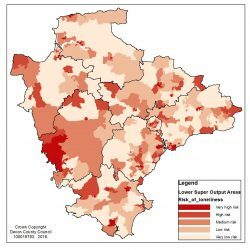 Age UK have produced loneliness heat maps, which look at the pattern of these and related factors and predict the risk of loneliness in local areas http://www.ageuk.org.uk/professional-resources-home/research/loneliness-maps/. Table 10.8 sets out Devon wards in the very high risk of loneliness category. 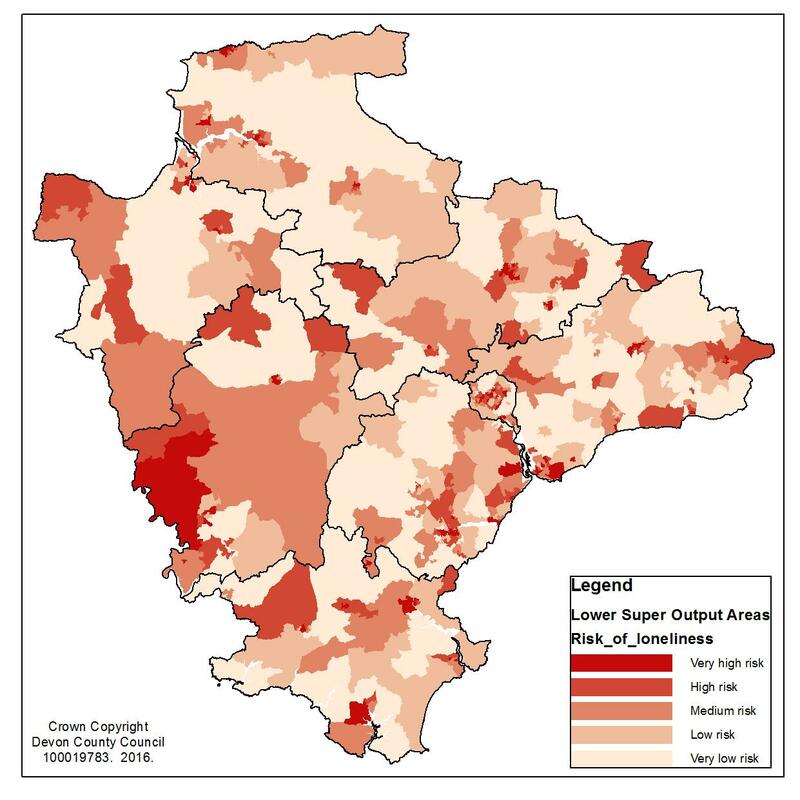 Figure 10.29 shows the pattern across the five categories (Very high risk, high risk, medium risk, low risk and very low risk) across the whole of Devon. This reveals that levels of loneliness are typically higher in urban locations, more deprived areas and areas with a high proportion of care homes.